Ok – so I do need some serious help making YouTube clips but I couldn’t resist putting something together with the new sample cards that have just arrived. If you’d like a copy of the new brochure, or to find out more about Phoenix please ask me. Flamingo Paperie are always looking for new artists to add to the fabulous range of cards that they produce. I thought it might be helpful to share information about the artists that design Flamingo cards, stationery and gifts. Our exclusive illustrations by Alison Vickery were amongst our bestselling designs in Phoenix Trading. Everyone who is an Independent Flamingo Paperie Partner or is in my Customer Club gets to vote on which designs get through to each new product launch. So becoming a Flamingo artist is not necessarily as subjective as you might expect. Conversely 1000’s of people will vote on your design. Alison also takes part in the Stroud Open Studios in May each year. Find out more about how to become a Flamingo artist. 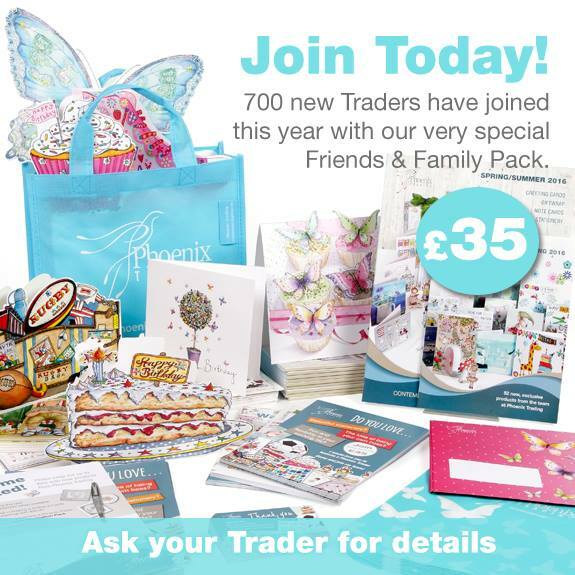 Go on – give it a try – and I look forward to seeing your work in the next Trader survey! And if you’d like to know how you could have the privilege and joy of selling her work too then ask me for more information about becoming a Flamingo Paperie Partner today. Flamingo Paperie are always looking for new artists to add to the fabulous range of Flamingo cards that they produce. I thought it might be helpful to share some information about Alison Hullyer. Alison is one of the artists that designed Phoenix cards, stationery and gifts. Phoenix Trading has now closed and I am part of the new company Flamingo Paperie. One of Alison’s latest illustrations is a gorgeous notecard design. This is new in the February 2018 Flamingo Paperie range. This is illustrated by Alison Hullyer who has been an artist for Phoenix Trading since 2002, and now Flamingo Paperie. 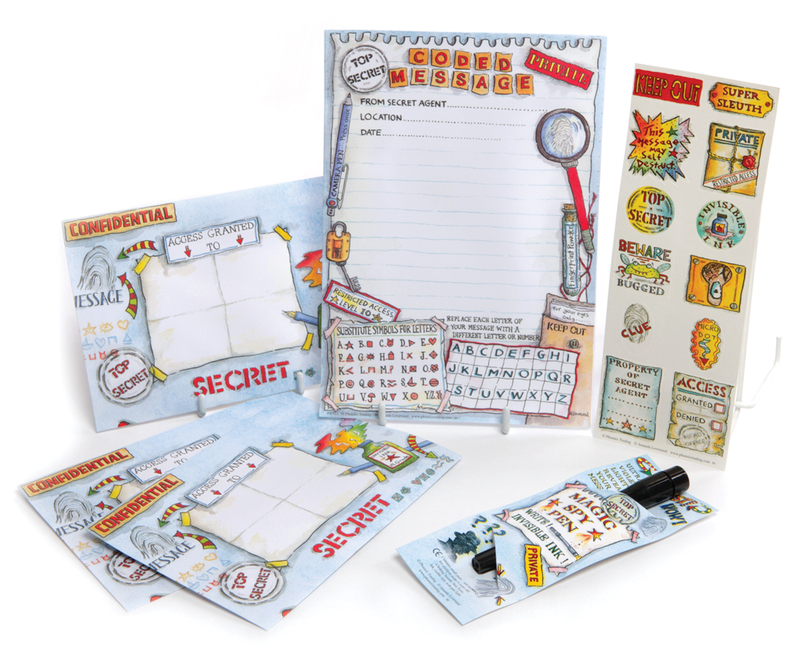 Her designs include animals, cars, age related cards, pencils, hearts…and lots more! Members of the new Flamingo Paperie Customer Club will get to vote on new designs. This influences heavily which designs get through to each new product launch. This means that being accepted as a Flamingo artist is not necessarily as subjective as you might expect. In fact 1000’s of people could be voting on your design. This is something Alison particularly loves “as they know what sells and can provide valuable feedback from their customers”. So if you’d like to see designs before they go to print and have your say join my Customer Club today. Alison is a member of the Cambridge Open Studios where 200 local artists open their studios to the public each year in July. 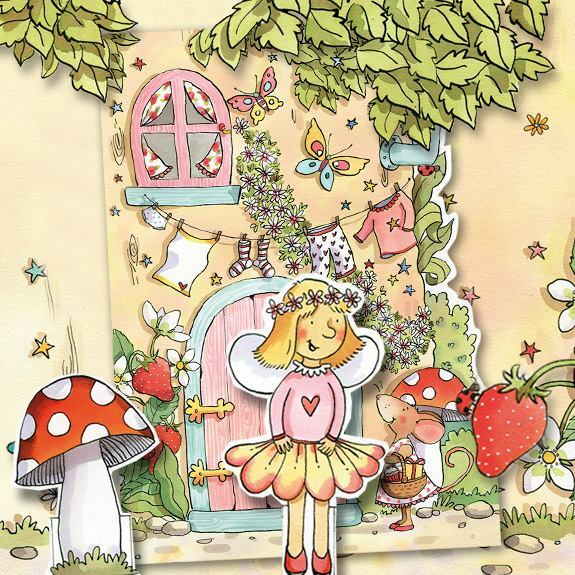 As well as cards, many of her illustrations are available in fabrics and coasters too and she has her own online shop. Find out more about how to become a Flamingo artist. Go on – give it a try – and I look forward to seeing your work in the next survey! Phoenix Trading were always looking for new artists to add to the fabulous range of Phoenix cards that they produce. I’m sure Flamingo Paperie will be too. I thought it might be helpful to share some information about some of the artists. 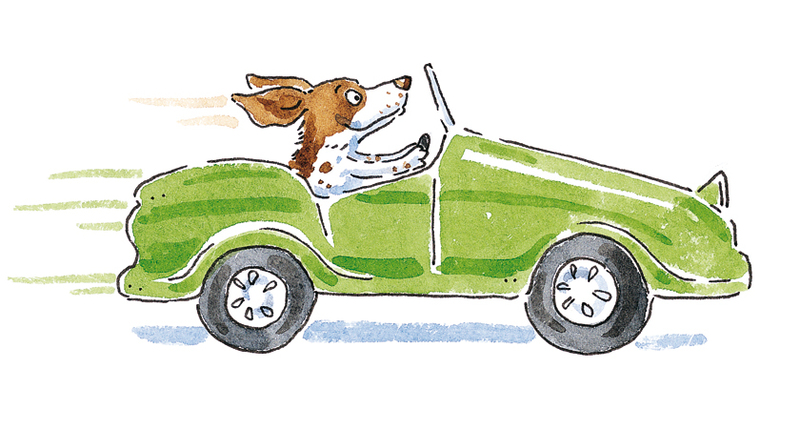 Julia Rigby produced illustrations for Phoenix since 2002, with her very colourful artwork featuring designs with people, vehicles, beach huts, farmyard scenes and even a tower of shoes! 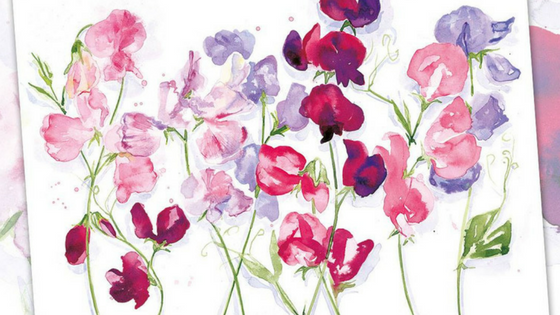 She works mostly in watercolour, ink and gouache resulting in very bright, colourful designs. You might not know that everyone who was an Independent Phoenix Trader could vote on which designs got through to each new product launch. The same will happen with Flamingo Paperie. What’s more, even being a member of my new customer club will mean you have access to these surveys too. Becoming a Flamingo Paperie artist is not necessarily as subjective as you might expect as 1000’s of people could vote on your design. If you’d like to know more about becoming a Flamingo Paperie artist please ask me. Go on – give it a try – and I look forward to seeing your work in the next survey! Just as Phoenix Trading were always looking for new artists to add to the fabulous range of Phoenix cards that they produced, so too are Flamingo Paperie. I thought it might be helpful to share some information about Amanda Loverseed. 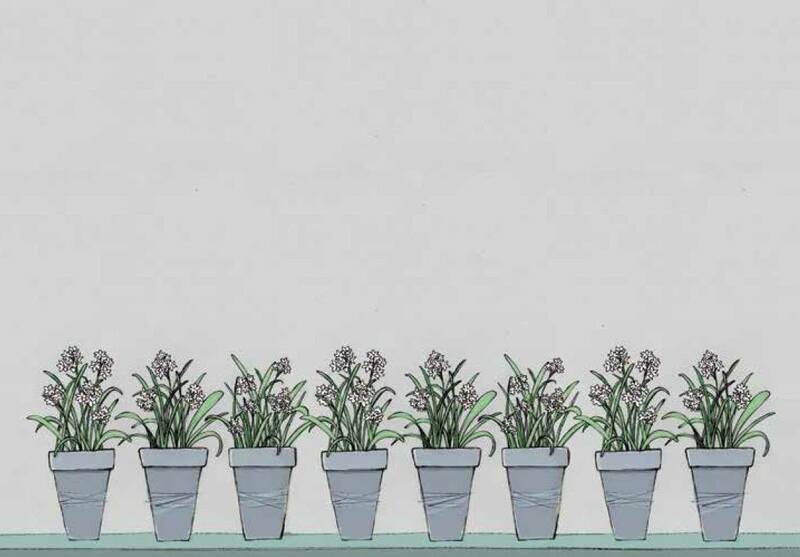 Amanda is one of the artists that design Flamingo Paperie cards, stationery and gifts. 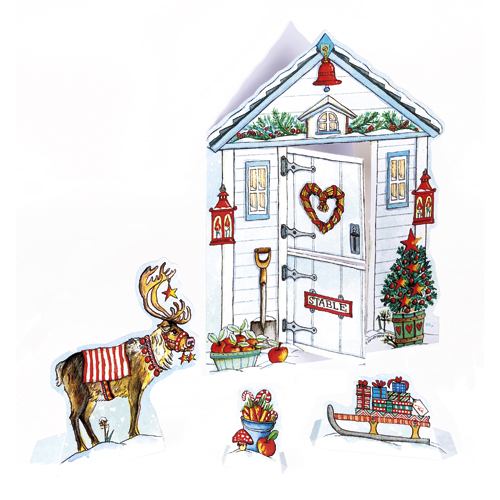 One of her current designs is the Reindeer Stable Christmas Card. You can see a video of a slightly different way of displaying it here. Amanda Loverseed is probably one of our most well-known and perhaps most recognisable artists. That is to say her artwork is easily recognisable as it is very distinctive! She works mostly in pen and ink and watercolour, making her work very detailed and very bright. She likes working in a variety of styles and on different subjects, one day drawing black Skull and Crossbones and the next Blue Butterflies. And yet her work always has that distinctive ‘Amanda’ look and most of her work has a signature snail too! ‘I have always worked as an illustrator. I studied illustration at Cambridge College of Arts and Technology and immediately, after leaving college, had my first two children’s books accepted. It is particularly interesting to work on designs that require research such as the ‘Kings and Queens’ poster. I live up a track in the middle of a field with my husband and two cats, Millie and Spinach. I have a wonderful view of the South Downs from my studio window and, whenever I get tired with drawing, I walk along the track and the two cats come with me. If I am out and about I am always looking for inspiration, such as a quirky building or car that will make its way into a ‘Cut Thru’ design or an idea for Christmas cards seen in the spring. I’m glad that meeting happened in 1999 as it’s a privilege and joy selling her designs! 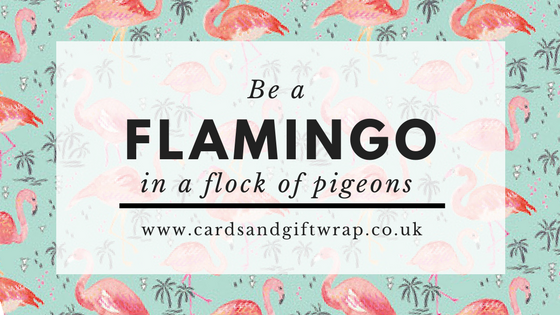 Everyone who is a Flamingo Paperie Partner gets to vote on which designs get through to each new product launch. This means that 1000’s of people could be voting on your design. Not as subjective as you think is it? kits, most notably by Bothy Threads. In particular her cut-thru designs that have also often appeared as Phoenix cards too. Some of these have been made in to giant posters and jigsaws. One of my favourites was her cut-thru spaceship! And if you’d like to know how you could have the privilege and joy of selling her work too then ask me for more information about becoming an Flamingo Paperie Partner today. We keep hearing that no one does send Christmas cards anymore. Depending on which survey you read you might think sales of Christmas cards are on the increase or they’re doomed. Well I’m not sure what to believe there but I do believe that sending cards is a great thing to do at any time of the year and Christmas is a good time to do it. 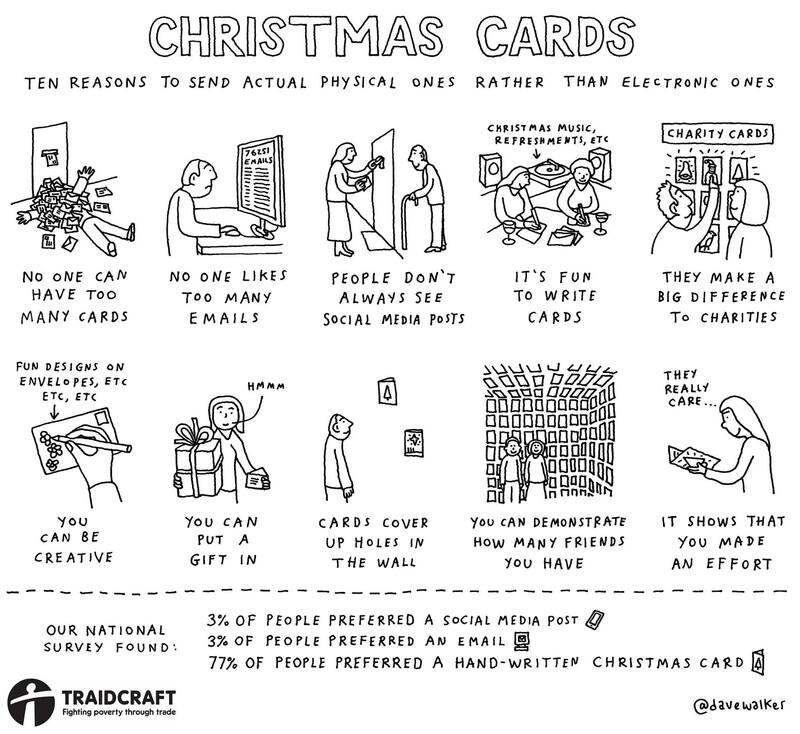 A survey by Traidcraft found that people do still send Christmas cards and there are lots of good reasons why. Traidcraft drew up the cartoon strip below after their survey in 2015. The 2016 showed that even more people (84% compared to 77%) in that year said they preferred to receive a hand written Christmas card. The Archbishop of York, Dr John Sentamu, a keen social media user, is lending his support to the organisation’s call for people to put pen to paper and send personal, handwritten charity cards to their friends and family this Christmas, rather than relying on social media messaging. Dr Sentamu said: “Perhaps more than any other time of the year, Christmas is a time when everyone should feel connected, loved and enjoy a sense of belonging. “While social media and text messaging are great and convenient ways to stay in touch with friends and family, handwritten Christmas cards really are the best way to show someone that you’ve taken the time to think of them at this special time of year. What more do I need to say?! You may not know this but most wholesalers don’t give a percentage of their profits from the Christmas cards they make to charities. Flamingo Paperie are different. For every Christmas card sold the Phoenix International Charity donates 1p to charity. They have so far donated over £1.8m to good causes. Our Christmas cards are charity cards. Every single one of Flamingo Paperie’s Christmas cards are charity cards. Just to clarify – this is the donation from the wholesaler, not the donation from the retailer. When you look at the back of Christmas card packs you’ll usually see the donation made by the retailer. In the case of the cards I sell, I am the retailer! So do I make a donation to charity? Yes! Nearly every event I attend is a charity event. Whether it’s the stall fee or a raffle prize there is nearly always a charitable donation made (this is for any event, not just Christmas ones). I also do loads of fundraising events for local charities. For example a gift wrapping evening for a local church women’s group. At an event like this I donate a minimum of 10% of all sales (not just Christmas cards) to their charity of choice. Businesses who wish to buy cards for sending corporately this Christmas can choose which charity they would like their 10% to go to. I can do this through justgiving.com so I can link your company to the donation. Individuals who wish to hold an individual event, like a coffee and cards, can choose to donate 10% of the total sales to a charity of their choice. Hopefully this helps to explain a little how Flamingo Paperie Christmas cards don’t just look good, but do good! If you are from the Western Isles you will be interested to know that the wholesale charity donation from all UK sales of Phoenix’s Christmas cards in 2016 benefitted local charity Hebrides Project Alpha. I successfully nominated them as one of the chosen charities for Christmas 2016. They received £150 from the Phoenix International Charity. I nominated local Beavers and Cubs from Laxdale to receive a donation from Flamingo Paperie’s 2017 Christmas Cards. I must get asked this question so often by people considering joining my team of Independent Flamingo Partners. My answer to this question probably applies not just to Flamingo Paperie direct selling but to all direct sales opportunities and possibly to all businesses too. How much you make depends on how much you’re prepared to put in. I don’t believe there is any get-rich-quick-with-little-effort scheme. Flamingo Paperie direct selling is no exception. To build any successful business you need to invest time and effort, a lot of positive mental attitude and probably some wise financial outlay. Don’t expect to start your new business with a new personal online shopping website and for people you’ve never met to suddenly purchase huge amounts from your website without ever seeing the product or having a recommendation from someone who has. People need to see a product between 3-7 times before they will make a purchase and they are more likely to purchase based on a recommendation of someone they know and trust. So if you’re not prepared to repeat a sales activity at least 3 times then it’s probably not worth doing. It takes time. You will need to be determined. People will say no, it happens. Are you prepared to ask someone else? The more you ask, the more ‘nos’ you will get but you will also get some ‘yes-es’ and if you don’t ask you won’t get the nos but you certainly won’t get the yes answers either. People aren’t really buying the products, they are buying you. Customers need to trust you before they will buy. If they already know the product then they might trust you because of the trust they already have with the brand you’re selling but if they don’t know the product then they have to trust you first. That’s why when new Traders start in my team I always suggest they begin with an at home launch event with friends. These people already trust you, they have probably already ‘seen’ your product through you talking about it so they’ve already had a ‘visit’ to your stall, even if only in their mind. It constantly amazes me the number of new Traders who refuse to do an at home event and then wonder why they struggle. If you can’t start with the people already within your trust circle you’re making it very hard for yourself to get your business going. How often do I hear people wanting to start a new at home business with no financial outlay. Often the reason is fear, not a lack of finances. If you really want something, you’ll find the money. If you’ve bought the product and you like it, then surely others will too? Most direct sales companies offer really good, heavily discounted start up stock packs. This isn’t to lure you into the business. They know that starting a business is the hardest part. However, with a good start up stock you are more likely to recoup your initial investment quickly and have repeat customers on board. So perhaps you’ve read all this and are now thinking that Flamingo Paperie direct selling is not for you. Well, maybe I’ve saved you a little heartache – or perhaps I’ve helped to prepare you to invest in your business. Maybe you can see the bigger picture, which is that when people who trust you, buy from you, and keep buying from you, then tell others who in turn become customers, that’s how your business grows. Perhaps now you won’t focus so much on the success or failure of an individual ‘event’. Instead you’ll see a process of growth that has many individual steps to it. You might also be asking if there is a limit to how much money you can make? Through sales alone then yes there definitely is. At some point you’ll be so busy you’ll have to turn down events. There are only so many orders and deliveries you can make. If you want your business to grow then you need a team, a network of Partners who work with you and that you support. In return you’ll get commission from the parent company. How much, just like with your income from sales, is up to you. 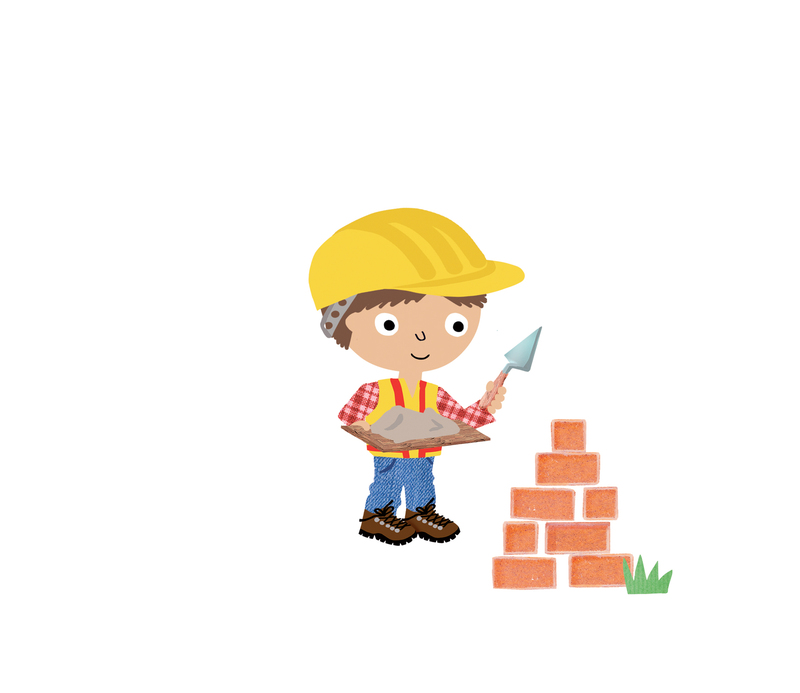 You can start building your team from day 1. In direct sales every Partner has the potential to earn as much as anyone else. We all buy at the same level of discount and we call get the same commission opportunities. This is why it’s not a pyramid scheme. How much you earn depends on how much you put in. Today I received a golden envelope in the post. Inside was a Phoenix Trading golden ticket, uniquely numbered and addressed personally to me. Sadly there was no chocolate bar beside it. What’s more the ‘prize’ is for someone else. 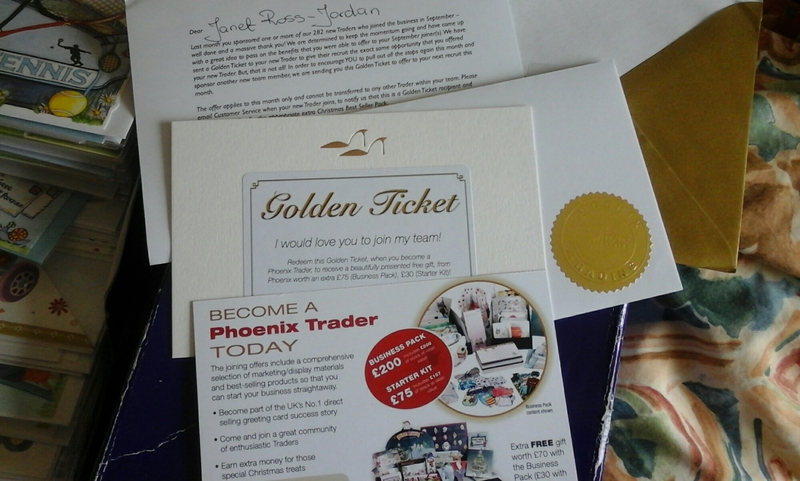 Anyone who joins my team this month will get my Phoenix Trading Golden Ticket. This means you will get either £15, £30 or £75 of products free with your starter stock pack. (The amount depends which pack you choose to start with either the £35, £75 or £200). So if you appreciate the best artistic talent, love cards and stationery and are self motivated. If you want to build your own business or just want to get your hands on great products yourself. Get in touch quickly. I only have one ticket and the first person who meets those criteria will get it. The ticket is valid until the end of this month so get in touch soon or take a look at my Why Phoenix? post to find out more.